I was rereading Bonhoeffer’s Life Together the other day, and I got the chance to discuss the book with some students at Luther Seminary. I was struck again by the grace and passion of Bonhoeffer’s writing. In many ways, the seminary community at Finkenwalde was the culmination of Bonhoeffer’s life’s work, drawing together his theological convictions (set forth in Sanctorum Communio), teaching experience, and experiences of the power and presence of Christ first-hand in Christian communities around the world, from his parish in Spain to the black churches of Harlem to the monasteries of England. The tragedy is that his life’s work and greatest passion was destined to be short-lived. The seminary at Finkenwalde was closed in 1937 by the Gestapo, the state police of the Nazi regime, after only 16 months of operation. Bonhoeffer then directed his considerable talents to a much different enterprise of active resistance and conspiracy against the Nazi regime that would lead to his imprisonment and eventual execution in 1945. Life Together comprises his reflections on the community that he spent his life preparing for and creating, lest the beauty and vitality of the experience be lost to memory. We should read it not so much as nostalgia but rather as instruction. Christian community was Bonhoeffer’s way of resisting the powers of the world. He viewed the gathering together of Christians for prayer, worship, confession, and Bible study as a fundamental part of Christianity. Christians gather together because they are Christians. Not only is community a mandate of Christ, it is also the location of Christ’s encounter with humanity in the world. Bonhoeffer and his seminarians were not sequestered in Finkenwalde to escape the Nazi regime or withdraw from public life. They were gathered to be strengthened and then sent out into the world. They were gathered to learn what it means to be followers of Jesus Christ. It was in Finkenwalde that Bonhoeffer gave his lectures on cheap grace and costly grace that he then published in the powerfully written work Discipleship. The seminarians were resisting the powers of the world, represented so tangibly in one of the most notoriously evil regimes in human history, by gathering together in Christian community. Their very existence as members of the Confessing Church was a statement of resistance against the state-run church of Nazism. Christians today do not often see their gatherings as conspiracies or resistance to the powers of this world. More often, Christians are trying to align themselves with the powers (how many of our churches continue to display the flag at the front of the sanctuary?) and emphasize their role in making good citizens. 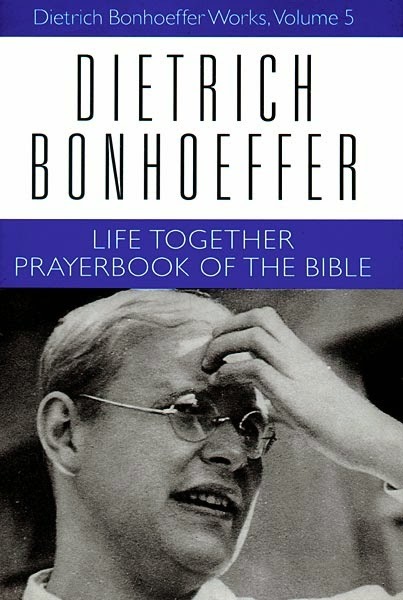 Bonhoeffer’s message is that life together as Christians is transformative because it is in Christian community that we encounter the living Christ. A people that follows Christ and actually heeds the teachings of the Sermon on the Mount (again, see Discipleship) looks radical in the eyes of the world. This is a people that confesses sins to one another, prays for each other, and loves its enemies. How many of our churches actually practice personal confession in the way that Bonhoeffer describes? It is easy to idealize Christian community and talk about how wonderful it is when true Christians get together (insert obligatory reference to Acts 4:32-37). We love the idea of Christian community, and there is a false notion that true Christian community should be free from hypocrisy, deceit, and anything else that might indicate the presence of real humans. Those fond of quoting Acts 4:32-37 do not seem to know about the very next verse, which tellingly starts with “But…” In Life Together, Bonhoeffer is not interested in the idea of Christian community. He is interested in genuine, on-the-ground, real community, and he recognizes that these communities are messy. There is dissension, discord, and grumbling. Sound like your congregation? Good! That means there are real human beings there. If there are real human beings in community, there can be genuine encounter with the other, and this is always messy. Bonhoeffer writes, “Christians must bear the burden of one another. They must suffer and endure one another. Only as a burden is the other really a brother or sister and not just an object to be controlled” (p. 100). This is also, Bonhoeffer insists, precisely where we encounter the living Christ. People with an idealized vision of church are destined to leave the church or at least jump from congregation to congregation at the first sign of discord. Their idealism is the enemy of life together because it eschews encounter in favor of niceness. We need messiness, and we need encounter. We need more than an hour on each Sunday morning when people do not happen to have another commitment. We need places of sufficient trust where people can express their doubts and dissent without fear of punishment or estrangement. There are few places where Christian community, as Bonhoeffer describes it, exists in the church today. I believe that camp is one of those few places. I do not want to idealize camp communities. That would be disingenuous. There are problems in every camp community. Bonhoeffer insists, however, that these problems are okay and probably inevitable where true community exists. Directors and participants often idealize camp because they want more people to go. The truth is that camp is far from picture-perfect all the time. It is messy. People get grouchy when they live together in a small cabin or tent for a whole week. It is human encounter in a rawness very uncommon in today’s world. Like Bonhoeffer’s seminary communities, the camp communities are temporary communities that live together for a short period of time. The difference in duration is real and important. One week is far too short a time. However, in that short week, genuine encounter happens and Christian communities are formed. Maybe these are the communities that can offer new vision and guidance for the church of the 21st century. Maybe these communities have the power to be subversive and transformative in ways that will enliven and revive the church. Maybe they can be forms of resistance to the powers of this world and communities of empowerment from which Christian disciples are sent forth. Through his long imprisonment, Bonhoeffer often reflected on his experiences of Christian community in Finkenwalde, and he drew strength from these experiences (see his Letters and Papers from Prison). His closest friend and personal confessor, Eberhard Bethge, was one of those community members. Christian community, with all its messiness, sustains us through our times of trial. As I write this, I find myself remembering the camp communities, particularly the summer staff communities, that I have been a part of through the years. I think of specific people. I am grateful for those experiences, and they continue to sustain me in my times of doubt. I found this encouraging. Community in spite of the mess of living. Yes, and I think Bonhoeffer goes even farther. Community is not in spite of the mess but, rather, it necessarily includes the mess. Christ shows up in the midst of the brokenness. Genuine encounter does not call for us to overlook the faults of others, "take the good with the bad," or endure the other's shortcomings but, rather, to take the whole messed-up person and love them. Let's make this simple. Subscribe to the blog to get the latest research, stories, and data from the Sacred Playgrounds team sent straight to your inbox! No spam, we promise.